Today I woke up late...I missed my history class. I went to my other two classes...very boring as usual. I got home at around 1:30. I went to the library to get a couple of books on Niccolo Machiavelli for a research paper that is due on Wednesday I hate research papers the most out of everything.....I just don't like them!!!!!!!! UGHHHH~ Then on Friday I have two midterms...Sociology and Humanities. I'm not too worried...I just need to re-read the books. Tomorrow is gonna be the worst though....cause I have to finish this paper....I'm so sad!!!! YAY!! 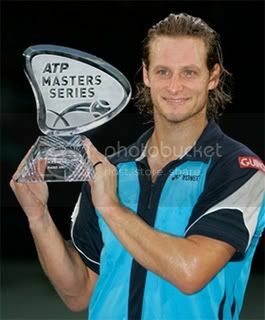 David won the Paris Masters as well!! I can't believe it!! I am so proud!!!! He beat Rafael Nadal in the final ( 6-4, 6-0 )!!! It took him a little over an hour! WOWOWOW!! This is my baby cousin Austin!! ^________^ Isn't he cute~Last week we celebrated his 6 Month...b-day? I dunno what to call it~ He is so cute and smart!! 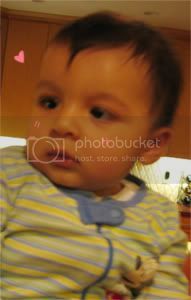 JANNA~ i love you~ I feel like it was yesterday that he was born. Time passes so quickly...My dad is really attached to him. I have huge a family...everyone wants to play with Austin...but Austin likes to be with my dad only hahaha~ It's so cute ^____^I might see him on Thursday (I HOPE~). My cousin is taking my sister and I out for dinner...I'm sure he'll bring Austing along!